I HAVE discovered that the medical profession is suffering from the ‘Polish-plumber’ syndrome. In the past three years since visa restrictions were lifted on the 10 new nations joining the EU, doctors from such countries as Poland,The Czech Republic and Slovakia have arrived in their thousands. At first the government encouraged them to come. Now, British doctors find themselves competing for jobs with their new EU colleagues. The rivalry would have remained hidden if it hadn’t been for the shambles brought about by the government’s new online recruitment scheme which has resulted in 30,000 junior doctors competing for about 20,000 posts (See page 12). A call to the Medical Register Council on Tuesday revealed, for instance, that there are now more than 10,000 doctors from France (539), Germany (4,133), Italy (1,579), Greece (1,842) and Poland (1,979) working in the NHS, most of them juniors, and most of them at hospitals. Before the visa bar was lifted in 2004, the number of doctors coming from Poland averaged about 17 a year, then it leapt to 498 in 2004, 743 in 2005 and 179 in 2006. Unlike doctors trained in non-EU countries, EU medics are not tested for their English. In fact, many are known to find difficulty with the language, and it is not uncommon for colleagues to have to act as interpreters in the hospital clinics. This particular edge to the recruitment chaos was highlighted in a letter from 52 senior consultants and medical academics in the Independent on Saturday. Among the signatories was that of Professor Humphrey Hodgson, who holds the chair of medicine at the Royal Free and University College School of Medicine. After stating that the online system failed to shortlist 35 per cent of UK-trained doctors for an interview, the doctors argue that the “selectors were caught out by the numbers of applicants from all EU countries”. This is a polite way of saying that many UK doctors were edged out of a job – for which they were fully qualified – by the new entrants from the EU. The anger of these senior members of the profession, protective of their trainees, boiled to the surface when they wrote that the UK doctors “lost out to doctors from the wider EU with greater skill in self-promotion and plagiarism”. Plagiarism? That’s a nasty word, I thought. But Professor Hodgson wouldn’t elaborate when I rang him at the Royal Free on Tuesday except to reiterate what has been said by many critics of the government who have complained that many applicants have been able to buy off-the-shelf answers from private companies to tricky questions. Is this possible, I asked the professor. “It is absolutely believable when you consider that identical phrases were found in answers by different applicants,” he said. 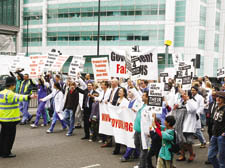 The letter appeared on the same day as around 10,000 junior doctors took to the streets of Camden in protest. Hardly reported in the press, with little footage on TV, the march, in my opinion, was as significant as the demonstration against the Poll Tax that helped to bring down Mrs Thatcher. There was the same spontaneous atmosphere – though the participants were from the other end of society. Most of the home-made posters told the story. One came from Mums4Juniors, another pleaded, “Support our training, Support your NHS”, a cruder one asked Patricia Hewitt to “kiss my MTass” – the target of the march was the government’s new system called Medical Training Application Service (MTAS). New Labour has spent years trying to appeal to Middle England. Here it was on Saturday – and it was angry with the government. Politicians complain young people have turned their back on politics. They may not have known it but the marchers were taking their first political step. Presumably, she meant that the sheer act of publicly protesting had given a fresher meaning to her life. New Labour see the middle-class as being against the collectivist spirit. If New Labourites had been on the march they would have seen that the shambolic decisions at the Department of Health have started to politicise the very class they have written off. A POEM was waiting for me when I dropped in on Michael Foot this week. The 93-year-old former Labour party leader had recently been entertaining his biographer Kenneth O Morgan and the BBC Radio 4’s Today programme in a live broadcast from his Hampstead home. The subject of the broadcast was of course the biography itself, whose publication has provided a golden opportunity for some lively retrospective sniping from his old Labour colleagues - Roy Hattersley and Gerald Kaufman among them. Foot was characteristically humorous and magnanimous: Hattersley is “a great writer and journalist,” said Foot but was only half right in what he said in his Observer review (whose headline was: “A great man, a lousy leader”). And of Kaufman — reputedly coiner of the memorable description of Labour’s 1983 manifesto as “the longest suicide note in history” – Foot would only point out that Kaufman himself had been elected to Parliament on that very manifesto. He was full of praise for the Labour MPs who voted against the government last week. “Some people seem to think I should be ashamed of marching to Aldermaston. But we should be back doing more marching against the Trident. We need to rid the world of nuclear weapons,” he thundered. He said that of all the things he had done in his life, the biography of Aneurin Bevan was the one of which he was most proud. And he urged me to read out loud the final two lines of the poem. AM-DRAM group the Hampstead Players aren’t shy of ambitious productions – recent performances have included Stoppard’s Arcadia and a production of Julius Ceasar. But adapting the 12,000-line Milton epic, Paradise Lost, into a two-hour play, is a feat that deserves special mention, especially when it includes former top QC John Willmer, in the cast as the voice of God. Did his love of acting ever spill over into his professional life, I asked him at the cast’s dress rehearsal on Tuesday? * Paradise Lost is at Hampstead Parish Church in Church Row on Friday and Saturday at 7.30pm.